Last week, I was at the Institute of Directors in Pall Mall and went to see my friend Caspar Craven speak. Caspar really inspired me during a recent interview to produce my own set of values and vision statement with my family, just as you would for a team. This has been very valuable for us. Besides setting up successful businesses and sailing around the world, his family set the intention of having magical family experiences. Where did this take them? Well two years sailing around the globe with three young children and an amazing set of adventures. 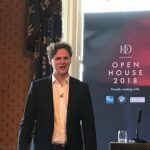 This has led to what I have no doubt will be a very successful book and with such a powerful story who knows what else…..
Key messages for me personally from his very engaging speech were ‘if you set your mind to something you can really make it happen’. A clear direction for your family and team is of course essential . All engaging leaders or those aspiring to be should also reflect on the old African proverb ‘If you want to go quickly, go alone. If you want to go far, go together.” As Caspar also says ‘A happy team is a fast team’.